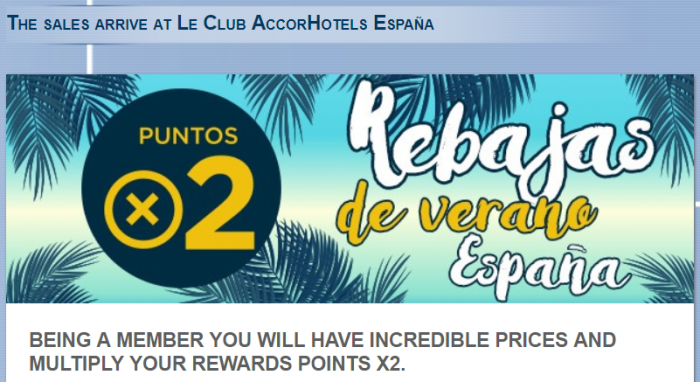 Le Club AccorHotels has launched new double points promotion for stays at ibis hotels in Spain between August 1 – September 15, 2017. There are also two Mercure and Novotel hotels in Madrid where members can earn double points during the promotional period. The valid booking dates for this offer are August 1 – 30. You have to keep in mind that the Le Club AccorHotels members earn reduced number of points for ibis stays compared to higher brands. Double points merely “normalize” the earnings. 1. The terms and conditions of Le Club Accorhotels apply to the “Le Club AccorHotels” rate available during the period of the offer at participating hotels. 2. This offer is valid for stays between 01/08/2017 and 09/15/2017 at one of the participating Accor hotels, and booking between 01/08/2017 and 08/30/2017. 3. This offer entitles members of the Le Club Accorhotels program, regardless of their condition, to benefit from obtaining X2 bonus points at one of the Accor hotels participating in the offer. 4. The number of bonus points for this offer is calculated according to the points earned by the member based on the “Classic” level. 5. You must book your stay to benefit from this offer at www.accorhotels.com or on the website of the participating brand. 6. You must provide your loyalty card number or membership number when making your reservation and present your card at the reception of your hotel when you check-in for your stay. 8. Reservations that include several stays covered by the same member during your stay are only counted as one stay. 9. This offer can not be combined with other current offers or advantages and does not apply to groups. 10. This offer is subject to availability. The general terms and conditions of sale apply for the specific reserved public rates for each hotel.